Once any infection has diminished or is gone, then steroid or anti-inflammatory eyedrops may be used to reduce swelling and help prevent scarring. The use of steroid eyedrops is controversial and should only be used under close supervision by your Eye M.D. It is possible that steroid eyedrops may worsen an infection. If symptoms of corneal ulcer continue after treatment--including pain and redness of the eye, tearing and discharge from the eye and blurry vision—let your ophthalmologist know right away so a different course of treatment can be started promptly. Collagen cross-linking with photoactivated riboflavin (PACK-CXL) is a new treatment shown to be beneficial in the treatment of advanced corneal ulcers and infectious keratitis (bacterial, fungal and amoebae) who have failed standard medical therapy. 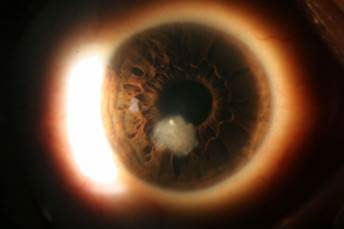 Recent studies have shown that PACK-CXL can prevent corneal melting and the need for urgent corneal transplantation. We have the capability of providing this treatment both at our Baltimore, MD and our York, PA offices. For more information on Corneal Ulcers, see our Patient Education Brochure, Here.